An Excellent Heirloom Garlic. 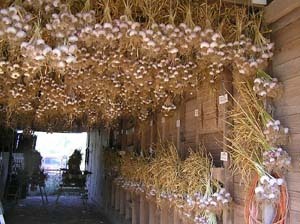 Excellent strong garlic for warm winter gardeners. This medium-large Italian artichoke is unusual in several ways; color, taste and storability. Lorz has more purple in the bulb wrappers than one usually sees in an artichoke and the semi-thick wrappers peel easily away revealing large cream-colored cloves with elongated tips and only the faintest hint of purple. It harvests in mid season and stores very well until winter. It averages seven large fat cloves in three clove layers and usually has no small internal cloves. It ranks 4-5 on the garlickiness scale and 8 on the pungency side. It has a semi-rich flavor and a lot of bite that just increases with age and it stores well for 6-8 months. Most Italian garlics tend to be somewhat mild, but this one is different. Depending on growing conditions, it can be very hot and strong. At first, it doesn't seem to have any aftertaste at all - then in a few minutes it begins to grow and becomes very noticeable and builds to a peak in about thirty minutes. If you like garlic with a bold flavor that really sticks around, this is for you. In years where the taste is milder due to growing conditions, the aftertaste is still strongly present, even though the initial taste is milder. A real garlic lover's garlic.